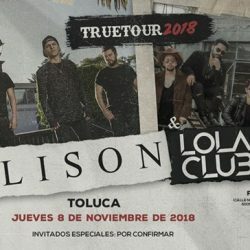 *VIP INCLUYE MEET&GREET CON ALLISON Y LOLA CLUB ASÍ COMO LA ENTRADA AL EVENTO. PUNTO DE VENTA: POKEMÓN SHOP (AV. INDEPENDENCIA ORIENTE #103 PLANTA ALTA, ZONA FRIKI LOCAL 41 Y LOCAL 18.